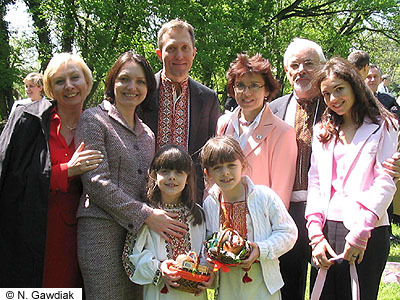 Left to right: Natalia Dmytruk; Myroslava Gongadze with twin daughters Nana and Solomiya; Adrian Karmazyn; Oksana Horbunova; Ihor Gawdiak; Katerina Horbunova. Oksana Horbunova, head of International Organization for Migration’s Ukraine office, and Natalia Dmytruk (center), the sign-language interpreter that courageously revealed the unscripted news about the fraudulent elections in Ukraine during a live broadcast, were in Washington DC to receive the Fern Holland Award from Vital Voices for their roles as leaders in civil society and active participation in Ukraine's democratic movement that became known as the "Orange Revolution". Joining them in this photo are Myroslava Gongadze, wife of slain Ukrainian journalist Heorhiy Gongadze, with their twin daughters, Nana and Solomiya. Ms. Gongadze and Adrian Karmazyn are both journalists for Voice of America. Ihor Gawdiak, President of the Ukrainian American Coordinating Council, is on the right with Ms. Horbunova's daughter, Katerina. The photo was taken at Holy Trinity Particular Ukrainian Catholic Church in Silver Spring, Maryland on Easter Sunday, which was observed on May 1, 2005 by followers of the Eastern rite Julian calendar.